Kate Middleton: I never thought I'd see her pass away. Charles: I felt the same. Despite irresistible piss-taking at Charles's expense throughout, Mike Bartlett's King Charles III, at the Almeida Theatre, is one of the most radical, imaginative and utterly frightening plays of recent years. A stellar cast have stellar material to work with, and the entire evening left me feeling utterly distraught – it's always good when that happens. The opening of this "future-history play" is everything Morrissey ever wanted: the Queen is dead. The bare stage fills with mournful, candle-bearing figures dressed in black, singing haunting choir song. This mixture of ancient ceremony, heightened emotion and majestic reverence for someone who is basically a rich grandma is disturbingly rousing, and here begins Bartlett's thesis: our country still defines itself through outdated conventions and the hereditary elevation of unremarkable individuals. These occasions feel like over-powering sensory experiences, and yet, they are crude anachronisms. Charles (brilliantly played by Tim Pigott-Smith) is finally getting the job he's spent a life interning for (albeit for more than travel and lunch expenses), so naturally, he is immediately thrown into existential crisis. A look into his private audience with the Prime Minister (Adam James on fine form) - a dramatic opportunity that seems to be currently much in vogue - reveals a monarch who feels insecure about his ignorance of political affairs: "They expect I'll have opinions, just there, ready to go – as if I know." It is when he decides he'll also meet with the Leader of the Opposition (Nicholas Rowe) every week too – a co-mingling of all the worst parts of Blair and Cameron – that Charles is speedily manipulated into thinking his position might actually hold some influence, and he resolves to refuse to give royal assent to a new, clearly Leveson-inspired, privacy law. It's an intervention of ego, not conscience that motivates Charles's actions. 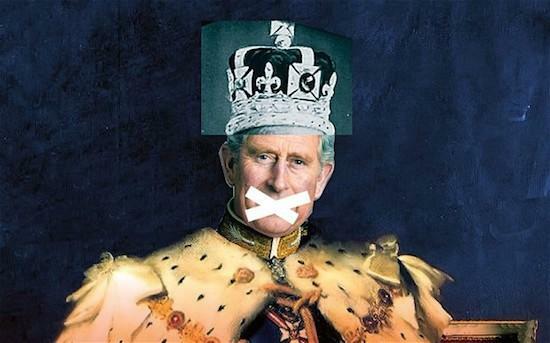 At one point he laments that he is "Charles no more" but an "empty vessel", "like a Spitting Image puppet". Realising that the top job holds no real, tangible power, his existence feels – is – meaningless, and he grasps at the first opportunity to deny his fate. And yet the decision, which resembles to all intents and purposes that of a petulant child, is catastrophic, plunging the country into the real possibility of civil war. But whilst Charles is exposed as being fatally disconnected from the public he serves, Prince Harry (a riotously funny performance by Richard Goulding), on the other hand, is bridging the class divide – to put it one way. In a nightclub, his friend suggests, "Now you're out of the army, I thought you might want to do a pleb." The pleb in question, Jess (the engaging Tafline Sheen), really is a common person – she even goes to St. Martin's College. She also happens to be a socialist and staunch republican, and by the time she's finished with Harry, he's in love with her and everything she represents. "We went to Sainsbury's! In the middle of the night! I bought a Scotch egg!" he marvels. Bartlett's play brings together two opposing worlds – obsolete institutions, dusty tradition and ostentatious ceremonies, and normality, supermarkets and 9-5 employment – and wonders if the former will ever release its death-hold on the latter. The prognosis isn't good. The play uses more than just Shakespearean language to show that we continue to be fascinated with the past. The Royal family are a pinnacle of our understanding of what it means to be British, and the suggestion that this is another institution on its way out, after the NHS, the police and the army, throws the public into a deep feeling of insecurity. The Prime Minister asks, "When does Britain get so cut down that it isn't Britain any more? What's underneath it if she is what held it together?" The fact that the play's essential conflict hinges on Charles's unwillingness to accept a new press law seems to acknowledge that, for some at least, the Royal Family feed an insatiable public desire for voyeurism. When Diana's ghost floats across the stage, in an inevitable allusion to Hamlet, many of the audience gasped. Afterwards and in between, people could be heard murmuring about their disapproval of this artistic decision – and yet, the legend of Diana lives on through her courting of the press, and people still buy papers that tell us on their front page that Kate Middleton's got a new haircut. 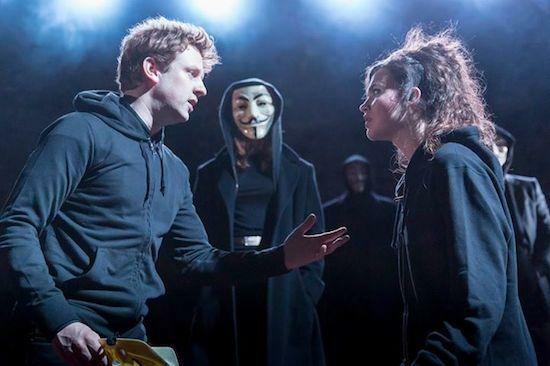 But this obsession with old, useless things even leaks into something that is thoroughly new: when Parliament is dissolved and Charles has not yet acceded to the throne, violence reigns in the streets and figures adorned with Anonymous masks stalk gather to protest. Even those searching for a brave new world hide behind a face from the past, with Guy Fawkes as the symbol of all they stand for. As public disorder grows, so too does interest in Harry's new girlfriend: the papers have printed something she sent on her smartphone as a "token of her love" – you can imagine what. Since Charles hasn't read the memo on what happened with all that Oliver Cromwell malarkey and decided to dismiss Parliament, the country is teetering on the edge of a national crisis, and suddenly, that dead grandma seems to have been rather important. Who can save us all, but the "king and queen of column inches", a.k.a. Will and Kate (uncannily good Oliver Chris and Lydia Wilson)? Kate is cast as a modern day Lady Macbeth, pulling all the strings, whilst Will's just such an everyman, isn't he, everyone can identify with him because he's just so approachable? So, isn't this great news? It all makes sense! It seems like there might be progress! These fusty old folks don't really understand Britain, but Will and Kate do! And Harry is going to marry a commoner, and the ivory tower is going to be dismantled one brick at a time, and the Royal Family will cease to be bulletproof bastions of privilege! Except that's not what happens, and that's where this play strikes its most fatal blow. After Charles has been betrayed, usurped, and sent stumbling off to be futile without bothering anyone, he condemns his son and daughter-in-law to their "golden age of monarchy that bothers no one". Nothing changes: neither Charles's vision of a monarchy claiming back its birthright to rule the land, nor the public's sense that Will and Kate and Harry and Jess will strip back the layers of social hierarchy. Since it would be far too dangerous for mere mortals to infect the royal "brand", Harry tells Jess he can't see her again, because she's "too big a risk to his means: stability". Will and Kate descend upon the stage in twinkling jewels and trailing robes. We've been here before. The towering sense of adrenaline as two solemn figures with shadowy faces kneel to be crowned makes one feel the same sense of excitement we might feel if we were watching an execution – and we may as well be. Their sanctification feels irrationally glorious; this coronation is also the enabling of further social divides and gross disparity of wealth. I left the theatre feeling horrified and genuinely frightened. King Charles III allowed me to see into the future, and it was beyond disturbing: time moved on, but we remained trapped beneath the same stagnant, oppressive oligarchs.